HighLow is a Binary Options broker owned by Highlow Markets Pty LTD. They are located at Level 14, Macquarie House, 167 Macquarie Street, Sydney, NSW 2000, Australia. Their phone number is 1300 168 668. Their email address is support@highlow.net. Now, when we discuss any Binary Option topic, there are some countries that have very limited alternatives to participate. Australia is one of them. Sadly, it is another country with high activities in the Binary Options and investing world in general. There are very few brokers that go against those obstacles and offer traders the opportunity to use them. This is the case of HighLow. Highlow utilizes the brand new Markets Pulse trading platform. Very original, unique, fast and friendly platform offered in English and Japanese. Some of their choices have a profit of up to 200% of each trade. 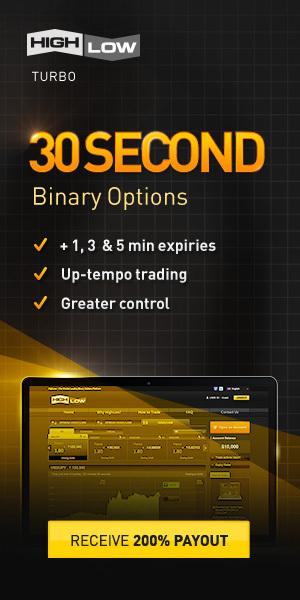 The broker has over 80 assets, including currencies to trade Binary Options. Bottom line, is the most popular broker in the world allowing Australian Traders. Besides the outstanding web-based platform, HighLow provides a Free App for Android and iOS, which makes even easier to invest using them. It is fast and simple to use, available in Play Store and Apple Store. Highlow broker IS NOT A SCAM. As it was pointed out before, it is not a secret that Australian traders have been struggling when searching for a reliable and trusted broker that works for them, without having to deal with an Non-Regulated corporation. Highlow is the most popular broker that allows Australian traders. Highlow is ASIC regulated, which is one of the most sophisticated licenses to get in this business. Nevertheless, they have an Australian Financial Services License from the ASIC in Australia. Their license number is 364264. Highlow requires a minimum deposit of $50 and a minimum trade size of $10 which makes it as well one of the most affordable brokers to invest in. Highlow is also one of the few brokers that offer a Demo Account for traders to test the platform which is very helpful for beginners or experienced brokers that want to test it before investing. The conclusion is that we are happy to say that Highlow is one of the best brokers for traders and the number one in Australia.